Serious deal hunters never step into a store without the proper savings tools in hand. Tracking down the hottest items lining aisles is simple enough, but finding the season’s best sales isn’t such an easy feat with the slew of online retailers and commercial stores all promising the lowest prices. Unlike decades past, when gift-givers had to rely on paper mailers to scope out the best discounts, smartphone apps have modernized the shopping process by helping consumers locate inexpensive Christmas gifts with just the scan of a bar code. Comparison shopping using applications like RedLaser makes saving money so much easier, cutting hundreds of dollars on overall holiday gift expenses and helping shoppers make educated choices when browsing for the best Christmas gifts in stores and on the web. Here are a handful of apps that make crossing off your gift list more affordable. 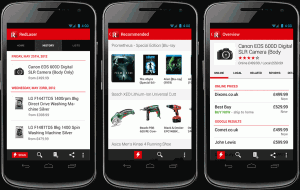 The RedLaser app is easily the most widely used smartphone application when it comes to comparing prices on a variety of products. Auction king, eBay, owns currently owns the RedLaser application and has earned the rave reviews of users with a 4.5 of 5 star overall rating from 6,552 users. While browsing a department store, for example, you now have the ability to find out if a supposed “best offer” really is, in fact, the money-saving deal it says it is. Simply scan the manufacturer’s bar code and RedLaser will aggregate the price information of the same product in competitor’s stores and from online sellers. Walmart and of course, eBay to name a few. You can even save yourself the trouble of hopping into your car and wasting gas money by purchasing directly from the RedLaser app for online purchases. SaleSorter is another helpful smartphone tool that in-store shopping enthusiasts can appreciate. Using your location, the app detects local sales in the area, and organizes the information based on which deal is closer to you. If you don’t mind braving the holiday rush at your local mall, Sale Sorter can assist in finding the best Christmas gifts on the cheap if you’re not quite sure what you’re looking for. Sharing deals is also easier with the easy share function. With a five-star review among iPhone users, SaleSorter has grown into a practical resource for shoppers on the go. “Great app to see what deals are happening around me — fast, intuitive and a great resource before I trek out to shop,” says RidingTheWave. What can be more rewarding for those who want to know how to save money, than an app that dishes out rewards just for getting to work on their holiday shopping list? shopkick is a rewards program that does away with those pesky loyalty rewards cards, and instead, provides users with “kicks” (i.e. rewards points) as they shop. A unique facet of this app is that you don’t necessarily need to actually purchase items to earn kicks; the app’s bonus board provides opportunities for you to scan certain products in stores like Target to earn extra rewards. User Danielle Bardinelli exclaims, “So much fun to earn rewards and discounts just by walking into a store or scanning products. I definitely recommend this app!”After going on your regular shopping run, kicks add up and you can claim swag like gift cards to big name retailers like Starbucks and Best Buy, or specific products like designer handbags. Originally the Internet’s leading coupon code resource, RetailMeNot has extended its money saving strategy to the app market. In addition to reliably offering online discount codes, the app provides a helpful in-store view of all the deals available in its database. You can now tote usable coupons into stores without the paper trail or having to fret about whether your printer has ink. The app also lets you save deals for later use, so you never have to sift through their bounty of discounts all over again. Whether you enjoy finding inexpensive Christmas gifts the old-fashioned way, like visiting the mall, or are more of a cyber shopper, these practical apps can teach you how to save money on your holiday gift list. LeBron James Promised Cavs an NBA Finals Win — Did It Pay Off?